Piera is a freelance illustrator, who graduated from Falmouth university. She has a passion for the great outdoors which fuels her work with travel reportage. 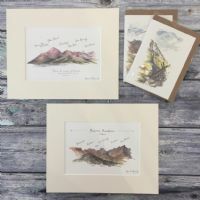 Living close to the Mournes, she focuses on her natural environment of flora, fauna and landscape, its history and the tales tied to the land. Through en plein air watercolour and sketches she tries to capture the true essence and atmosphere of her subject and aims to evoke emotion in her audience.